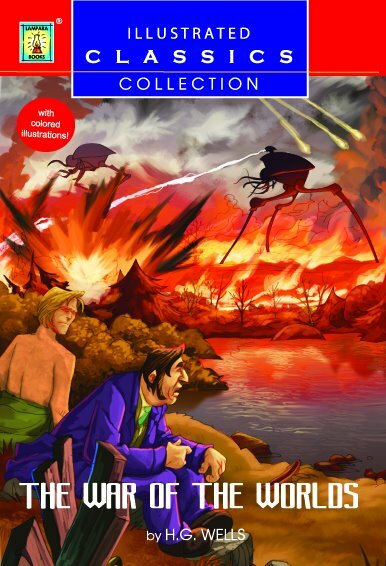 WAR OF THE WORLDS | Lampara Publishing House, Inc. In the last years of the nineteenth century, men do not consider a terrible danger might come from outer space. As they busy themselves with lives and little affairs, across the gulf of space, intelligent, unsympathetic creatures regard the earth with envious eyes, and slowly and surely draw their plans against men. The planet Mars must be older than our world and has lives in it before any living things roamed the earth. If has air and water and all necessary for the support of animated existence. With their temperature getting colder and the planet itself nearing its end, the Martians are forced to find ways to survive. It is 1894, a great light is seen coming from the planet Mars. Authorities surmise that meteorites might just be falling in a heavy shower upon Mars or that a huge volcanic explosion is in progress. "It's impossible that there's life on Mars'" one of them declares. Then comes the night of the first falling star. An enormous hole on the ground is created. The thing is buried in the sand. A strange humming sound is heard from the cylinder. It is being opened from within, until its lid falls upon the gravel. A big grayish rounded bulk, the size perhaps of a bear, is rising slowly out of the cylinder. It glistens like wet leather when exposed to the sun. Its head is rounded and has a face. It has two large dark-colored and intense eyes and a V-shaped mouth, which seems salivating.